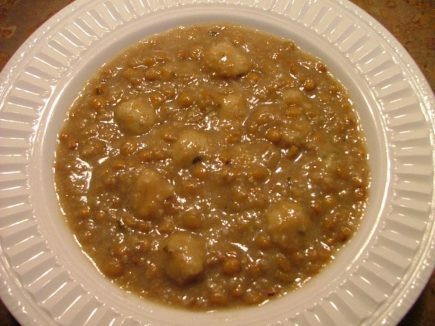 Wheat Balls: Soak 1 package of Jemila Kibbee Mix in 1 cup of water for 15 minutes. Mix with 3/4 cup of flour or more as needed for dough-like consistency. Shape into small bite-size balls. Boil lentils in water with 1 teaspoon salt for approx. 20 minutes. Add wheat balls and simmer for an additional 15 minutes. Add oil, garlic and lemon juice.